Thanks, Mail Carrier | Sports Illustrated Kids: The Perfect Holiday Gift for Young Sports Fans! Sports Illustrated Kids: The Perfect Holiday Gift for Young Sports Fans! These days it seems like there are more and more kids that fall into the category of already having everything. Do they really need one more plastic toy that will end up at the bottom of a toy box by New Year's? Fortunately, if the child in your life is a sports fan, the perfect gift is only a click away with a subscription to Sports Illustrated Kids, the magazine for boys and girls who love sports. No matter if your child prefers football or swimming, softball or soccer, Sports Illustrated Kids presents sports the way kids want to read about them: with great action photos, easy-to-read stories about star athletes, helpful instructional tips from the pros, humor, comics and engaging activities. As an added bonus to the entertainment factor, SI Kids is a great way to encourage kids to read, and it has won highest honors from the Association of Educational Publishers and the Parents' Choice Award. Reason #1: It's the perfect stocking stuffer. Reason #3: Each issue is full of exciting stories, photos and games that are a perfect distraction during holiday traveling. Reason #4: No gift wrapping – it's delivered straight to your door. Reason #5: It's the gift that keeps on giving the whole year through. 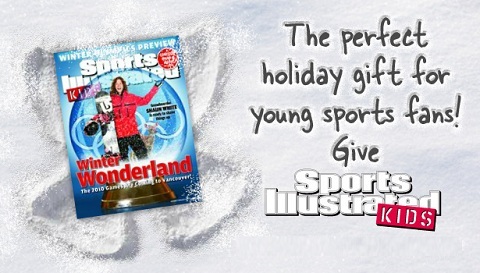 Have you thought of one (or two or more) kids on your shopping list that would love the gift of SI Kids? Not only is this a creative, entertaining and educational gift, but it is affordable as well! Right now you can give your young sports fan a one year SI Kids subscription in print AND on tablet for only $19.95... and can send a second one year subscription gift for only $5! Since 1989, Sports Illustrated Kids has delivered the excitement, passion, and fun of sports to kids, tweens and young teens in an action-oriented, authentic, and interactive style. This holiday season, it's time to bring the name that is the authority on kids and sports into your home as well! Find out more information about SI Kids by visiting SIKids.com and connecting with them on Facebook. And don't forget to take advantage of their great one year offer for $19.95 and a second subscription for only $5 deal that's going on now! I was provided with thank you gifts from Sports Illustrated Kids for my time in writing this post, but all thoughts and opinions are honest and my own. My grandson is very much into sports and watches basketball, baseball and football religiously. I think he would enjoy a subscription. You know, I did not know they had a Sports Illustrated for kids...live and learn.